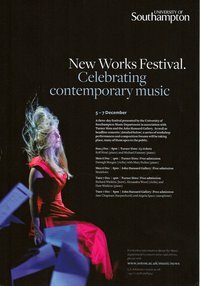 The full programme for Southampton University’s New Works Festival has been announced! As you can see below, there’s a quite staggering amount of music being squeezed into just three days, from student composers to classic names and everything in between. Fourteen world premieres. And some great performers. Lots of details on the festival’s Facebook page. There is also a page on Soundcloud featuring music by some of the student composers featured in the festival.